In yesterday’s post, we showed that a binomial distribution can be approximated by a normal distribution and some of the math behind it. Today we’ll take it a step further, showing how those results can help us understand the distribution of a sample proportion. Out of the last 250 visitors to your website, 40 signed up for an account. 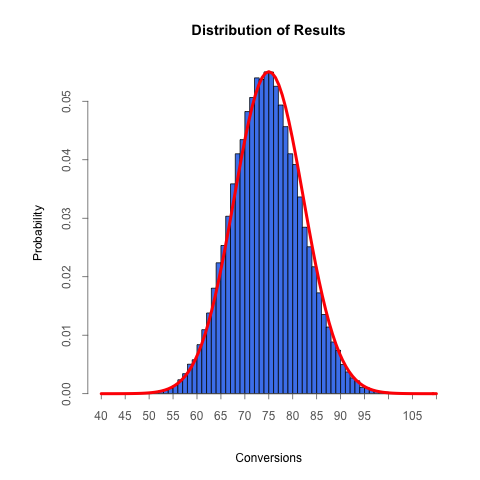 The conversion rate for that group is 16%, but it’s possible (and likely!) that the true conversion rate differs from this. 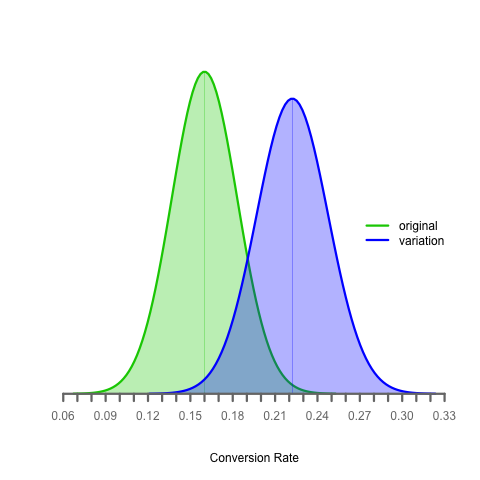 Statistics can help us determine a range (a confidence interval) for what the true conversion rate actually is. 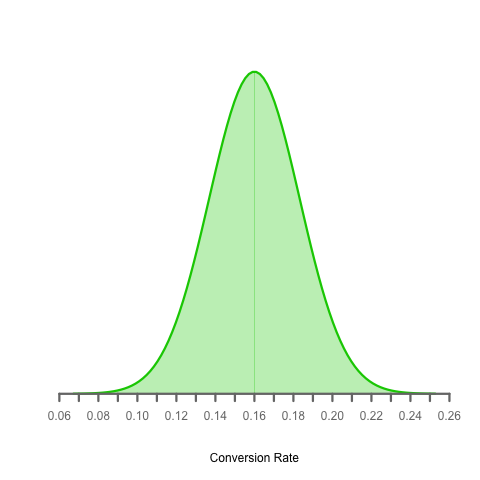 As you can see, the most likely conversion rate is 16% (which is no surprise), but the true conversion rate can fall anywhere under that curve with it being less and less likely as you move farther away. Where it gets really interesting is when you want to compare multiple proportions. What can we determine from this? Is the experimental version better than the original? What if the true proportion for the original is 20% (towards the upper end of its distribution) and the true proportion for the experimental version is 16% (towards the lower end of its distribution)? Each visitor to your website has a 30% chance of signing up for an account. Over the next 250 visitors, how many can you expect to sign up for an account? Simple enough and fairly easy to understand. Why are we taking the square root of the product of these three values? The textbook doesn’t explain, noting that “the formal justification that allows us to use the normal distribution as an approximation to the binomial distribution results from more advanced mathematics”. Because this standard deviation formula plays a big role in calculating the confidence intervals for sample proportions, I decided to simulate the scenario above to prove to myself that the standard deviation formula is accurate. 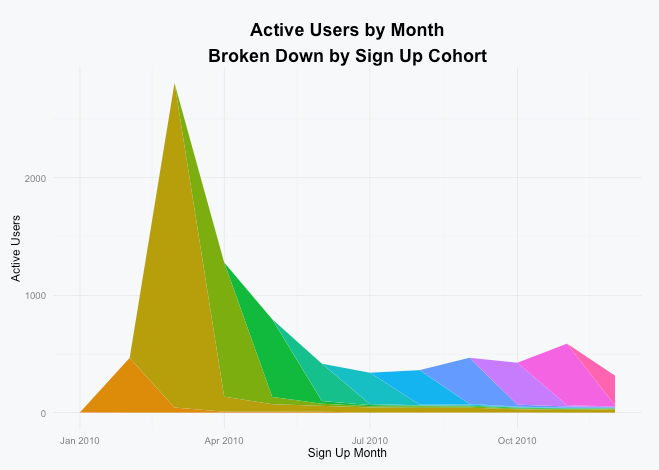 The R script below simulates 250 visitors coming to a website, each with a 30% chance of signing up. After each group of 250 visitors we track how many of them wound up converting. After all of the runs (the default is 1,000, though the higher the number the more accurate the distribution will be) we plot the probability distribution of the results in blue and a curve representing what we’d expect the distribution to look like if the standard deviation formula above is correct in red. 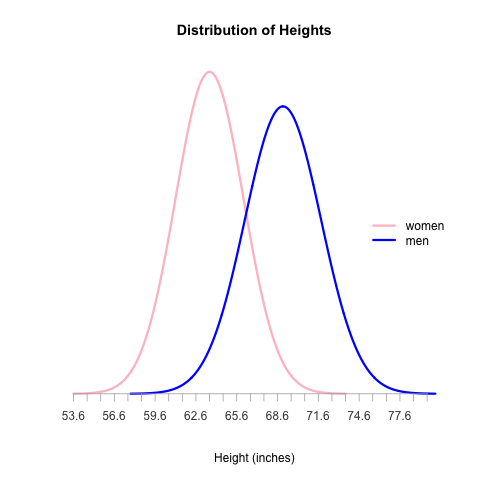 As we’ll see, we can use the fact that the normal distribution approximates a binomial distribution approximates to figure out the distribution of a sample proportion, which we can then compare to other sample proportion distributions to make conclusions about whether they differ and by how much (ie, how to analyze the results of an A/B test). I’ve been tinkering around with R for learning more about the math behind A/B testing and figured I’d share some of the work as I go. The website Stat Methods has an example showing how to plot a normal distribution for IQ scores, but as a beginner I found it hard to follow so I wound up re-writing it with comments, better variable names, and improved spacing. 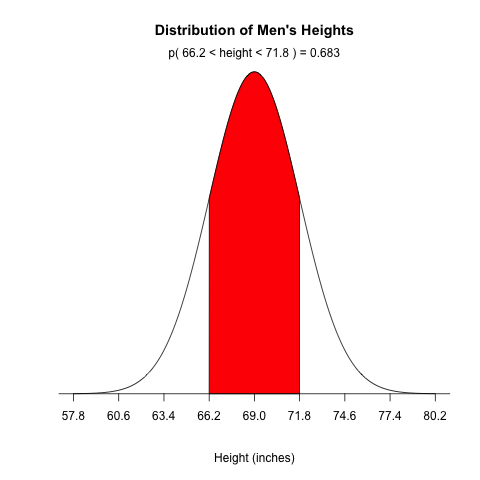 Also, instead of plotting IQ, I chose to plot men’s heights. # Display the text on the plot. The default "side" parameter is 3, representing the top of the plot. If you’re experienced with R and have any suggestions on how to improve this code, just let me know.